Home > Go Kart Parts > Go Kart Oil and Methanol > Manhattan Oil "Power Plus +" - 4 Cycle 32 oz. Manhattan Oil "Power Plus +" - 4 Cycle 32 oz. Power Plus Synthetic Four Cycle Racing Oil was specially developed to provide the highest degree of performance and protection possible in the most demanding of racing engines. 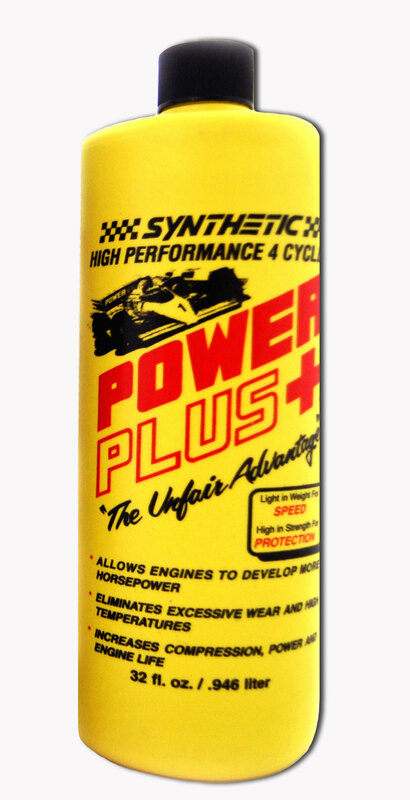 Power Plus Synthetic Four Cycle Racing Oil reduces negative drag, excessive wear and high temperatures. Dyno testing has proven significant horsepower increases when using Power Plus. Power Plus allows engines to accelerate quicker and turn more RPMs on the top end. This permits taller gear ratios to be run for more overall speed and better recorded lap times/ETs. Power Plus yields consistent lap times/ETs due to its advanced lubricant stability. On average, head temperatures run 15-30 degrees cooler. The high tech formula of Power Plus can be used in all climates in both small and large engines using methanol, gasoline or nitromethane. Power Plus is extremely clean leaving no major carbon deposits and allows for superior ring and valve seating for more compression and power.